Fill a deep-fryer or large heavy-based saucepan two-thirds full with vegetable oil and heat, then deep-fry cassava crackers, in batches, for 30 seconds or until puffed and crisp. Drain on absorbent paper. Process coconut cream, chilli, half the mint and sugar in a food processor until a purée forms. Transfer purée to a bowl, then whisk in mayonnaise, lime juice and remaining mint until just combined. Gently fold through remaining ingredients, season to taste with sea salt and freshly ground black pepper and stir to combine. 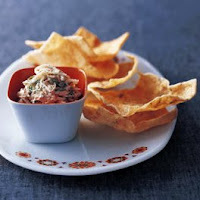 Serve crab, coconut and mint dip with cassava crackers passed separately. Best served on day of making. Cassava crackers are made from pounded cassava and sago flour flavoured with chilli, leeks and paprika, and are available from Pacific Island food stores. If unavailable, substitute prawn crackers or pappadams.